Named for its enduring strength, the Clydesdale Hauler is a beefy 600 lb capacity hard gauge plastic cart. It utilizes an “I” beam extrusion for added frame strength and to allow water, mud and dirt to sift through. The plastic won’t bend or rust and its 46” length has rounded corners that won’t destroy drywall. Use the easy-pull handle attached to its axle for no-tip turns through tight corners on 13” pneumatic tires. Great for contractors or gardeners who rely on dependability. This cart is heavy, looks good, does the Job! My husband And I collect Antique cars. We go to many swap meets for car parts,bumpers, Chrome, tires, garage cabinets, if fits our fleet, of 5 antique cars we buy it, Granny carts, and red wagons were not going to work ,this cart will carry a engine! after a trip to Stafford Springs, Conn. racetrack, we bought every thing we need for the long New England Winter, We both are satisfied with this Hauler! We love this cart! My husband is a scuba diver and we need to transport his tanks from garage to boat. 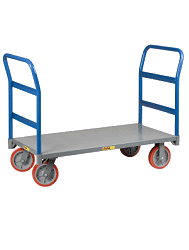 This cart is handy, so sturdy and roomy. Thanks for such a handy cart! We will also use this to take chairs/coolers to the beach!